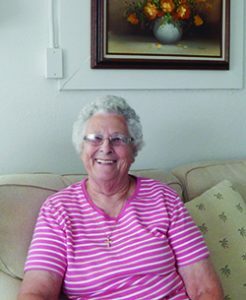 ■ BY SUE ERWIN – Betty Hill distinctly remembers arriving in Boca Grande for the first time in 1955. It was a time when there was, quite literally, nothing here with the exception of about 125 people and a bare-bones infrastructure of a town. She recalls that in the 1950s there was the post office, a general store, a few other buildings and a bunch of houses. The rest was just woods. Betty grew up in Holly Hill, South Carolina. Her maiden name was Lane. She met her future husband, Bobby, in Holly Hill, which is just south of Savannah, S.C. She was in third grade when first they became friends, and that friendship led to dating when they became teenagers. Betty’s father worked at a train depot and her mother was a homemaker. They had five children in four years, including a set of twins. Betty is one of them, and she has a twin brother named Jimmy. Betty and Bobby were married in South Carolina in 1955. Bobby worked on the family farm and also worked as a heavy equipment mechanic for a lumber company in South Carolina. “And when the lumber company closed, he started working at a cement factory across the street the next day,” Betty said. Bobby’s mother and his aunt worked at The Gasparilla Inn & Club during the winter months, then they would go back up to South Carolina every summer to work on the farm. After graduating from high school, Betty went to college for one semester. “I didn’t like it much, so I quit and got married when I was 18,” she said. The newlyweds spent six weeks in Boca Grande for their honeymoon. After they settled into married life, Bobby would come down in the winter months to do plumbing and help build apartments and other homes on the island. She said it was about a 12-hour boat ride from South Carolina to Boca Grande. “We’d leave home at about 3 a.m. and we’d catch the last ferry to the island at 3 p.m.,” she said. Bobby’s mother and father divorced when he was just a baby, and his mother later met his stepfather, Claude, here in Boca Grande. He was the only plumber on the island at that time. Claude and Homer Addison built the building where The Temptation exists today. Each one owned half of the building. They added four separate apartments upstairs just to the south of The Temp bar. They lived in the one facing Park Avenue and rented two others to local workers. The fourth one was a very small, one-person apartment that was built by a contractor who came from up north and was working on the island. “He was sleeping out on the deck at night, and he asked us if he could stay inside for free while he built it. We agreed to let him, and we became very good friends. He ended up living in that very same apartment until 2015,” Betty said. Betty said Claude was a “Jack-of-all-trades” who knew how to do just about every skilled trade … except carpentry. As if that weren’t enough, Claude won the very first tarpon tournament trophy in 1932, when the very first island tournament was held by the old Boca Grande Hotel. “He didn’t mean to win it. He went fishing and he told us he didn’t wanna catch anything. Then he took a crab and stomped on it, and he threw his line in the water. The next thing you know he had the fish,” she said. The steel trophy still sits on a table in Betty’s living room today. “It needs some cleaning up. I just haven’t gotten around to it. The top broke when the children dropped it, so Bobby had to drill a hole in it and screw it back on,” she said. Claude passed away at age 59. Betty and Bobby inherited the property after Bobby’s mother died from a stroke in 1985. “That was her second stroke. She had one a few years earlier, and the doctors told her she would never walk again. They said to put her in a nursing home.” But Betty refused. She brought her mother-in-law back to South Carolina, where she would have her do exercises two or three times a day. “And the day she kicked me in the stomach, I told her I wasn’t exercising with her anymore,” Betty joked. Soon after that, her mother-in-law was up walking again on her own. “She never lost her memory. She knew right where every single thing was in that house. She was sick at the same time my daddy was sick, so they would sit in there talking and watching television, keeping each other company. Meanwhile I painted my whole house outside,” Betty said. She said the Pink Elephant and The Laff-a-Lot (now known as South Beach Bar & Grille) were the only other restaurants on the island besides The Temptation in the 1950s. “Bobby and I would come down three or four times every year in the winter and work on the apartment buildings and fix things, until he passed away in 2012. I still do some things. I know how to do it, but I can’t do it all by myself,” Betty said. She fondly recalled that the first things she and Bobby built together in Boca Grande were a pair of end tables and a coffee table with a glass top for their apartment. As a matter of fact, her television sits on an original table she made with Bobby in the 1950s. “When I got a bigger TV, I just put a larger piece of plywood on top and I glued it. I’m not one for fancy stuff. I like to use what I got,” Betty said. Betty and Bobby had three children together – Bobby Jr., Trisha and Claude, who was named after his grandfather. All of them currently live in South Carolina, and all of them enjoy coming down to Boca Grande with their kids. “They just love it here. My oldest son just left last Saturday, and my youngest son is coming in two weeks,” she said. Betty said Bobby also worked on many of the waterfront homes on the beach in Boca Grande. She recalled a few in particular, including the du Pont home and the Crowninshield house. She said things really didn’t start booming on the island until the 1980s. “My, how this island has changed throughout those years,” she said. For years the couple, married for almost 58 years, did things together like work on old Volkswagen cars and give a lot of love to their pets. Recently they had two dachshunds, Boca and Gaspar. Betty said the secret to a successful marriage is to always say what you want to say, listen to your partner and hear what your partner says, and then just forget about it. “And never, ever go to bed angry,” she said. Betty is a strong, 80-year-old gal. She’s worked in the farm fields, she’s crawled under houses to lay pipe, she’s rebuilt car motors and made furniture. When a contractor who was hired to build a wooden fence around her home in South Carolina left before he finished the job, she did it herself. Betty and her twin brother, Jimmy, had a big family party last year to celebrate their 80th birthday. She has five grandchildren and four great-grandchildren. Her oldest grandson was married on the beach in Boca Grande almost seven years ago. Betty was only in Boca Grande for a few days on this last visit. It was the weekend of the World’s Richest Tarpon Tournament, and she was here visiting with her sister-in-law, Kristi Lynn, and making more memories to add to her lifetime collection.